See photos and read about the Marija Temo Model and how to order one. 2008 Marija Temo Model and the new changes. 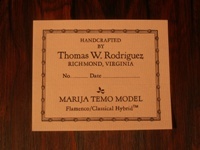 To place an order for your own Marija Temo Model, contact Tom Rodriguez at www.Rodriguezguitars.com Each of the Model’s will include my signature on the label. The “Marija Temo” Model is a hybrid flamenco and classical guitar which Tom Rodriguez, luthier, and myself designed together. We started attempting to make the hybrid around 1999, and in 2003 it was achieved. 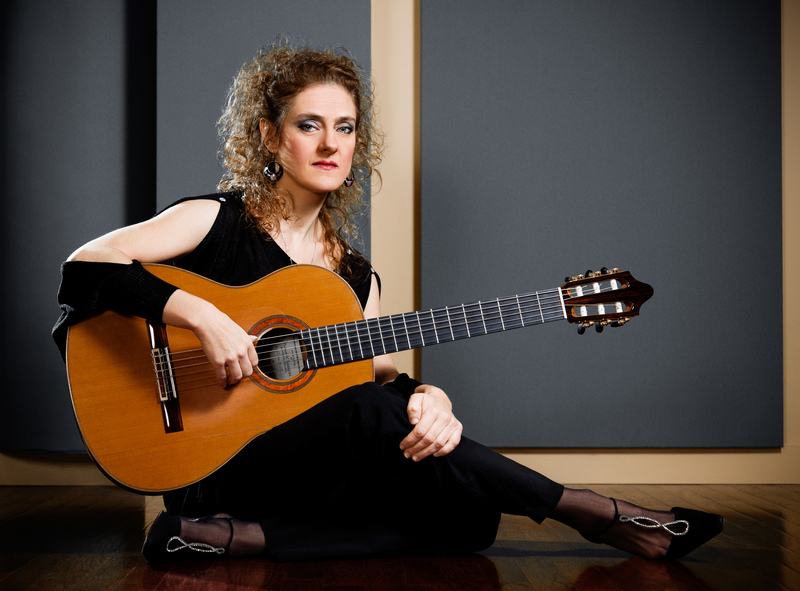 I had this idea for years to be able to play both flamenco and classical techniques on one guitar, simply because I had been equally playing both styles, and now, my playing is an absolute combination of the two styles where I naturally flow from one to the other. The hybrid guitar successfully combines and balances both flamenco and classical features in a single guitar. 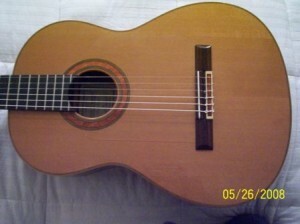 It is extremely loud, and has a bright and passionate tone when used for flamenco. The action is low enough to facilitate effortless right-hand flamenco strumming techniques, and yet is high enough to enable the warm, beautiful quality of the notes to be sustained and heard clearly when classical music is played. The craftsmanship and the consistency of these guitars are superb. 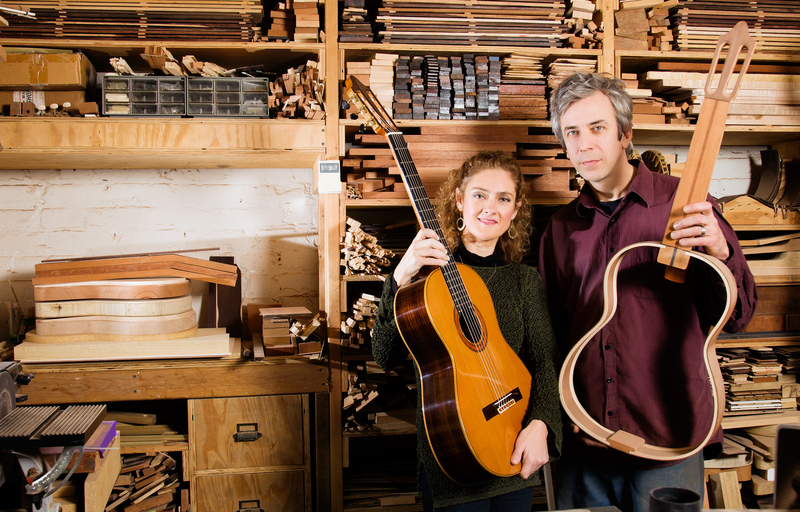 It has taken several attempts to develop and refine a guitar that embodies classical as well as flamenco qualities, and that is representative of both styles. I am overjoyed to be playing an instrument that allows me to combine the two styles without limitations or compromises. It is a joy to converse with my instrument and discover what it has to say. Tom is always striving to make improvements. 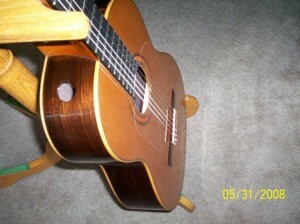 The latest Marija Temo Model made special for myself, April 2008, is a cedar top with an indian rosewood back. The binding is made of maple, and the rosette is made of amboyna (a natural red wood). Personally, I wanted a rosette that would represent flamenco, which for me is a red, passionate color. In addition he has added a soundport which makes you feel as if you are playing in stereo, and it also projects extra sound to the audience. He apparently has also changed the way he is going about bracing the guitar and with these latest changes, I hear an enormous amount of sound projecting from the instrument. It is like playing in surround sound. After playing a Spruce top for many years, it will be exciting and interesting to play on this new cedar guitar.